Rail station • Transit agency finds out that developer is former board member who resigned under fire. Leah Hogsten | The Salt Lake Tribune A fight is erupting over how to develop the land around the Clearfield FrontRunner Station. It had long been proposed as a transit-oriented development that would be a regional center for growth with apartments, retail and offices. Now, much of it may become a train car manufacturing plant for Stadler, a company that has been at the center of some UTA scandals. Leah Hogsten | The Salt Lake Tribune l-r UTA board chair Robert McKinley, President and CEO Jerry Benson and Bret Millburn discuss the Clearfield land site. 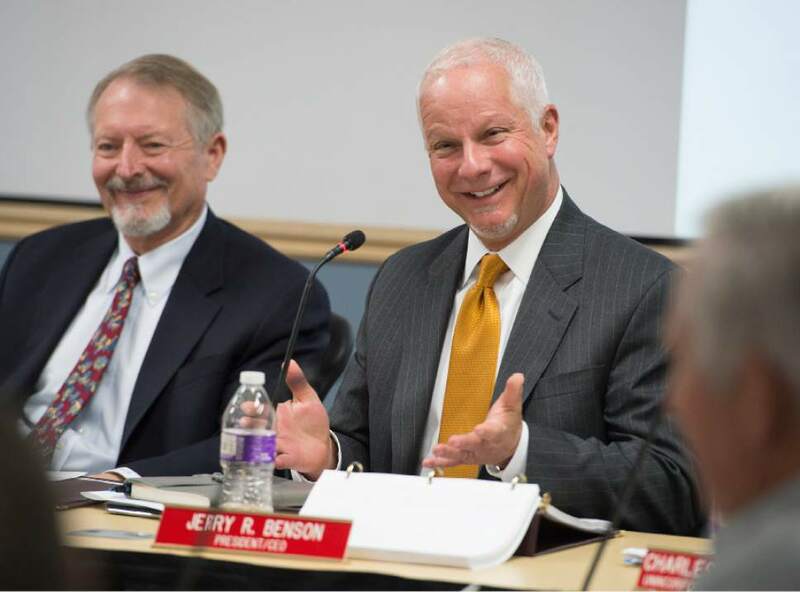 The Utah Transit Authority Board discussed logistics of the controversial UTA Clearfield land deal during their open meeting, Wednesday, April 26, 2017. Leah Hogsten | The Salt Lake Tribune l-r Robert McKinley and UTA President and CEO, Jerry Benson discuss the Clearfield land site. 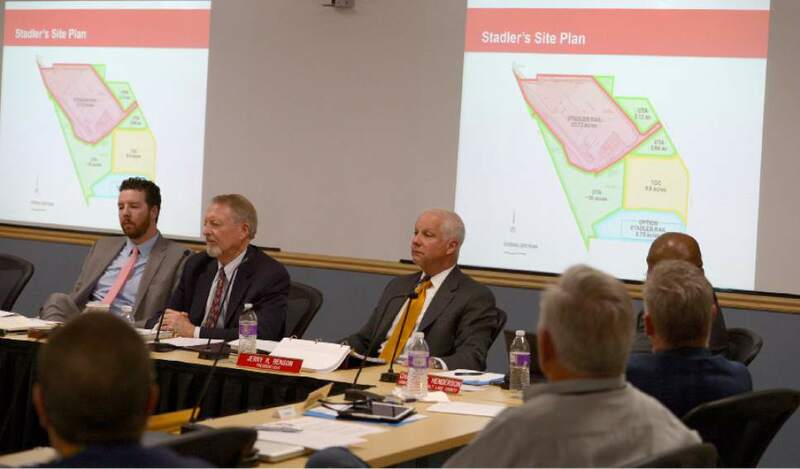 The Utah Transit Authority Board discussed logistics of the controversial UTA Clearfield land deal during their open meeting, Wednesday, April 26, 2017. Leah Hogsten | The Salt Lake Tribune UTA's liaison for Weber and Box Elder Co., Brent Taylor, who is also the Mayor of North Ogden. 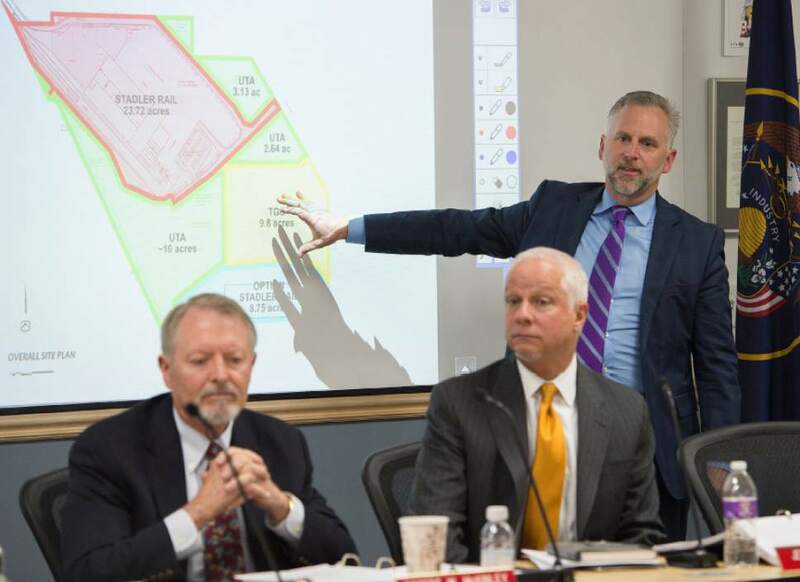 The Utah Transit Authority Board discussed logistics of the controversial UTA Clearfield land deal during their open meeting, Wednesday, April 26, 2017. Leah Hogsten | The Salt Lake Tribune Clearfield mayor Mark Shepherd argues on behalf of the city purchasing UTA land to bring Stadler Rail to the area for jobs. 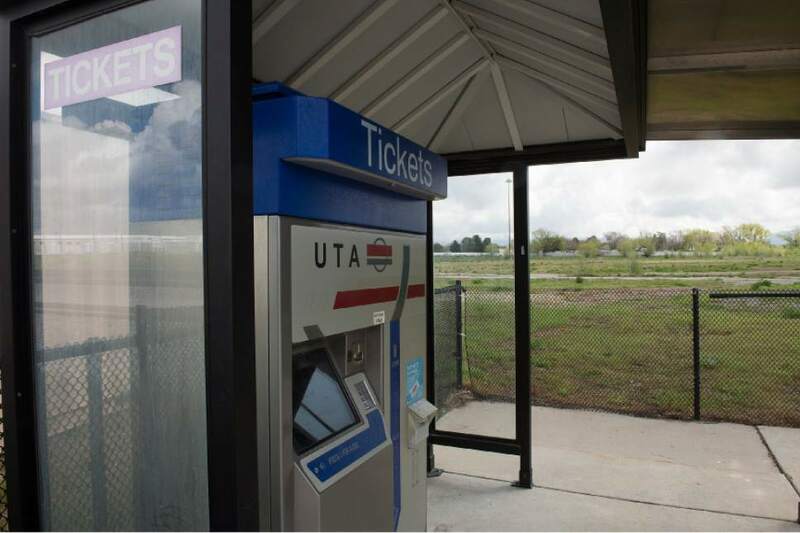 The Utah Transit Authority Board discussed logistics of the controversial UTA Clearfield land deal during their open meeting, Wednesday, April 26, 2017. Leah Hogsten | The Salt Lake Tribune l-r Jayme Blakesley, Robert McKinley and UTA President and CEO, Jerry Benson discuss the Clearfield The Utah Transit Authority Board discussed logistics of the controversial UTA Clearfield land deal during their open meeting, Wednesday, April 26, 2017. Leah Hogsten | The Salt Lake Tribune A fight is erupting over how to develop the land around the Clearfield FrontRunner Station. It had long been proposed as a transit-oriented development that would be a regional center for growth with apartments, retail and offices. Now, much of it may become a train car manufacturing plant for Stadler, a company that has been at the center of some UTA scandals. Leah Hogsten | The Salt Lake Tribune A fight is erupting over how to develop the land around the Clearfield FrontRunner Station. It had long been proposed as a transit-oriented development that would be a regional center for growth with apartments, retail and offices. Now, much of it may become a train car manufacturing plant for Stadler, a company that has been at the center of some UTA scandals. Scott Sommerdorf | Tribune file photo UTA board member Sheldon Killpack, a former state senator, went on the recently disclosed Swiss trip taken by several Utah officials to look at mountain rail systems. Leah Hogsten | The Salt Lake Tribune The Utah Transit Authority Board discussed logistics of the controversial UTA Clearfield land deal during their open meeting, Wednesday, April 26, 2017. 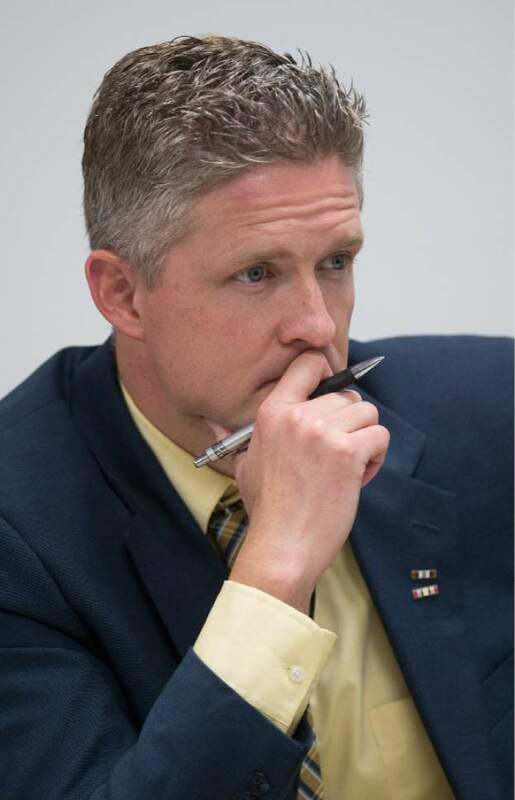 The surfacing of yet another name from past scandals spooked the Utah Transit Authority board on Wednesday into delaying its expected conditional approval of a controversial land development around its Clearfield FrontRunner station. The reappearing character is Sheldon Killpack, a former UTA board member who resigned under fire after he and other UTA officials went on a trip to Switzerland in 2015, which included a visit to the headquarters of Stadler Rail, a manufacturer of train cars. That visit forced UTA to discard bids at the time by Stadler and others seeking to lease a portion of a UTA maintenance facility because of the appearance of favoritism. Stadler later won the lease anyway, after a rebidding process. Stadler now aims to build a permanent rail-car manufacturing plant on UTA-owned land at the Clearfield station. The transit agency has dealt with Clearfield City and Davis County on the project because of the past controversy involving Stadler. 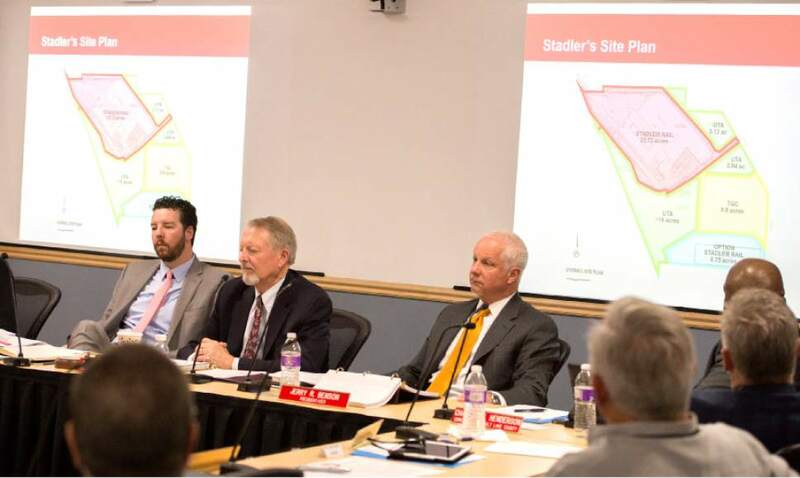 But the UTA board found out this week that Stadler plans to use a company owned by Killpack to build the plant. UTA General Counsel Jayme Blakesley said Killpack&apos;s involvement gives the agency pause, and he asked the board for time to see if that creates legal problems, or serious issues with real or perceived conflicts of interest. He also wants to see if Killpack&apos;s involvement could affect a deal that federal prosecutors announced this month to give UTA immunity in exchange for cooperation for an ongoing probe into former UTA officials and others. "The federal investigation dealt with international travel, looked at &apos;transit-oriented developments&apos; (TODs) and real estate transactions. So we need to understand his involvement simply because he did travel internationally while he was on the board. And this transaction is a TOD," Blakesley said. He noted that UTA also has a policy that bans former board members from involvement with TODs for a year after they leave the agency. He said Killpack has been gone about a year and a half  and also technically would not be directly involved with UTA. 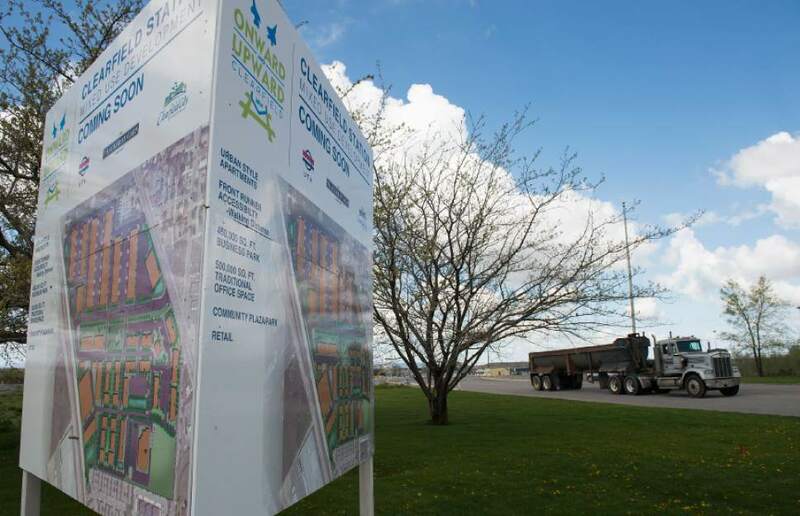 Clearfield City is proposing to buy about 24 acres initially of a 70-acre site around the train station, and then resell it to Stadler  at what Mayor Mark Shepherd says would be a discount to help attract the company that may create up to 1,000 jobs. Clearfield also may buy additional land there for Stadler later. Stadler has already won $10 million of incentives from the Governor&apos;s Office of Economic Development, plus a $1.4 million appropriation tucked into a budget bill passed on the last night of the recent legislative session. The company has powerful allies. Utah House Speaker Greg Hughes, a former UTA chairman, led the controversial trip to Stadler&apos;s Swiss headquarters. 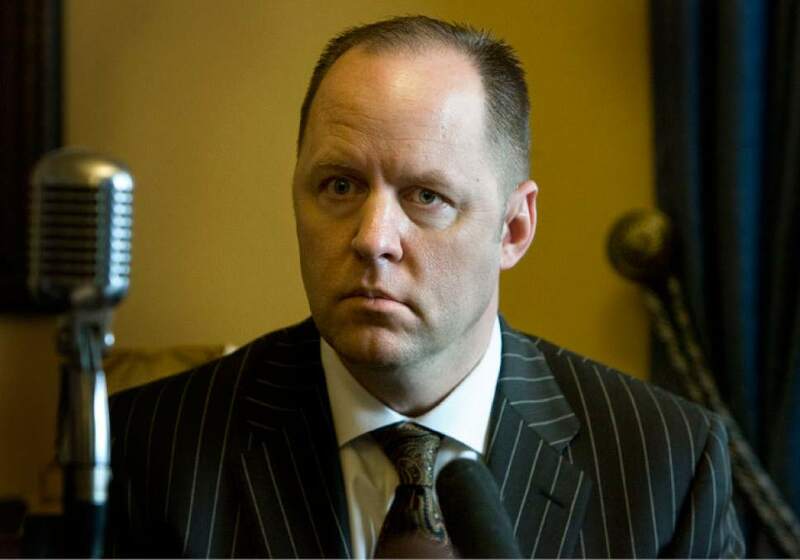 (As speaker, Hughes also appointed Killpack  a former Utah Senate majority leader  to the UTA board). Hughes has praised the company and efforts to attract it. Killpack and Stadler are not the only characters from past controversies involved in deals at the Clearfield site. Until recently, UTA&apos;s development partner there was the Thackeray Garn Co., owned in part by former House Majority Leader Kevin Garn. But UTA recently cut ties with the company for slow progress, what it said were unethical proposals with former board members (including Killpack) at other TOD sites, and for unfavorable contracts it said it discovered might never bring any profit to the agency. At the Clearfield station, UTA recently gave Thackeray Garn a parcel of land worth about $1.5 million to essentially cut ties and go away  and avoid lawsuits. It plans to build 216 apartments there. 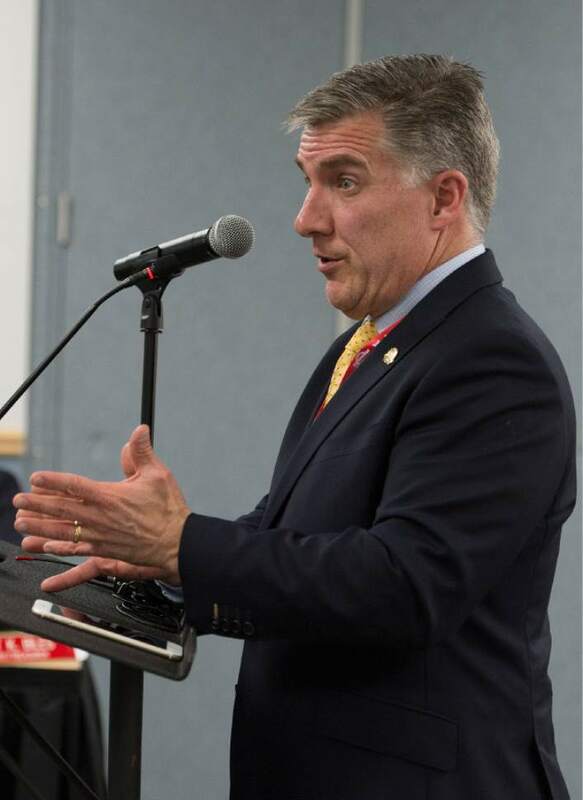 The UTA board discussed the proposed deal with Clearfield for 2½ hours Wednesday, including whether allowing a manufacturing plant there will ruin regional plans for smart growth. For years, UTA aimed to develop a mix of housing, offices and retail at the station to increase transit ridership. 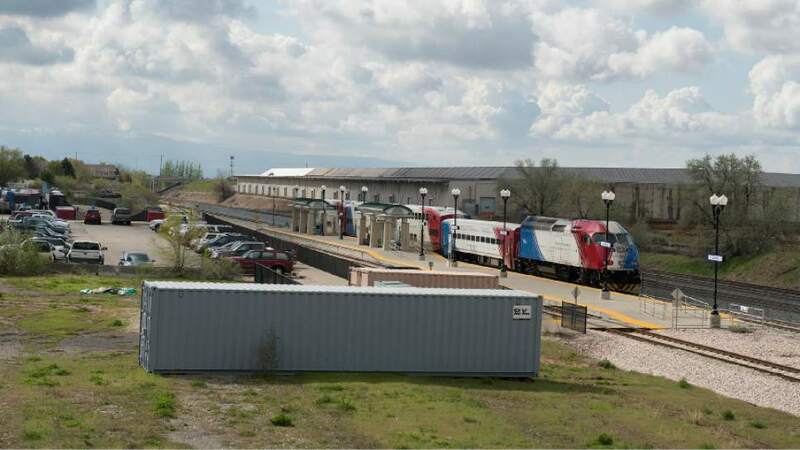 Regional planners saw it as one of a string of densely populated "town centers" around rail stops that could handle the projected doubling of Utah&apos;s population by building skyward instead of sprawling outward. Keith Bartholomew, who left the UTA board on Wednesday, said manufacturing plants may be built anywhere, but the smart-growth TODs can be built only around rail stations. He said last week that losing much of the land at Clearfield for the Stadler plant would be like losing old-growth forest. "It&apos;s not replaceable." But Mayor Shepherd told the board that after years of ambitious proposals that came to nothing, Stadler is the only feasible project on the horizon  and his city views it as crucial to boost its economy and revitalize rundown areas nearby. Stadler needs to have a plant in place by next year to fill orders, Shepherd said, and had sought at least conditional approval of plans on Wednesday to get started. Now, the board said it plans to take time to vet Killpack&apos;s involvement, have a public meeting on the proposal in Clearfield on May 10  and revisit the transaction at its next full board meeting on May 24. Some board members raised concerns that Clearfield has proposed to buy the land for half of what UTA appraisals say it is worth. But UTA and Clearfield have agreed to conduct another appraisal to try to narrow the difference. Board member Brent Taylor also questioned why UTA is not taking open bids for any sale of the Clearfield property. Blakesley said that would be required if the sale were to a private entity  such as Stadler itself  but is not required when the sale is to another governmental entity. Taylor said bidding would help ensure getting the best price possible for UTA. Also, several board members called for UTA to review whether it should be involved in TODs in the future, or exit such land developments because of the controversy they have generated. "Maybe we ought to re-look at whether the agency should be in the development business to begin with," said board member P. Bret Millburn, who is also a Davis County commissioner. He adds local communities should likely be the ones to oversee such developments.